Four-star Air Force Gen. Joseph Lengyel took to social media to apologize for a uniform gaffe committed while attending President Donald Trump’s annual address before Congress on Tuesday night. One thing is for sure … My ribbons will NEVER be upside down again,” Lengyel said on Facebook. Air Force... Why did it have to be the Air Force? In the words of Forest Gump "It happens"
Oh and "Stupid is, as stupid does"
Seriously, I've seen it at work during my Navy career a couple of times. Guys wives do their uniforms and sometimes you just don't pay attention and go to work that way. Now, going to a formal event of any kind is a different story. I've always kept a dress uniform ready to go, and a backup just in case. Same with ribbon sets, dress shoes and covers. He owned up to it and I'm sure he classifies it as a "teachable moment" that none of us are infallible. If you can't 'read' zoomie ribbons, see https://en.wikipedia.org/wiki/Joseph_L._Lengyel . I recognized the LM, BS and MSM as those are not service specific but all the others are Greek to me. I ascribe a certain amount of the realization of the faux pas by the public to the proliferation of 'stolen valor' claims of late. Had to be intentional. No officer would make that mistake. Ever. I had just arrived at my new MajCom assignment in 1988 and was called to the Awards Ceremony. As the general was pinning my medal, he mentioned that I was wearing my ribbons wrong. It was the 9th Oak Leaf Cluster and not many people see the 9th and he was wrong, but he did notice. So, I am also sure the gentlemen sitting with him noticed. And I am sure they busted his chops and that he bought a few rounds for it because he was wearing wings. I have real trouble understanding how he could have missed it. Whats even more perplexing to me is why didn't the other Flags point it out to him? One thing I really used to appreciate about the USMC was that they did not wear inordinate amounts of I-showed-up administrative award fruit salad. Last edited by TerryK; 02-10-2019 at 04:11 PM. Officers do sometimes make mistakes. The smart thing is to be very discreet in mentioning them. 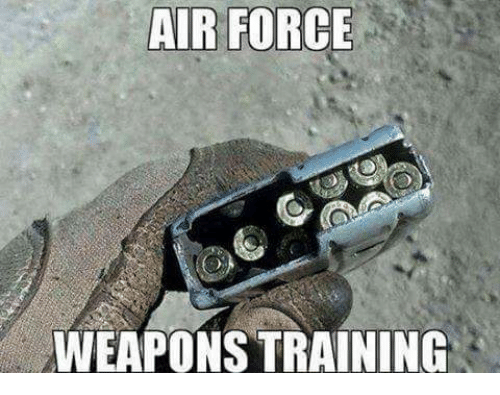 I recall watching one of my bosses struggling to re-assemble his 1911. I probably should have helped, but feigned ignorance, and indeed it had been a long time since I had seen one in pieces, but it really isn't all that complicated if you took it apart. Well he in in the chair force. There was a lot of worthwhile stuff in my military service, but I had a bad habit of busting out laughing at stuff that some people took real seriously. This would be one of those. I have to ask. Why is this news worthy? Its not like out military officers are infallible. If this was the worst mistake the military makes this month, IMHO, we should all be thankful. Maybe it was a "mistake"........or.......maybe it wasn't. Never during my 22 years of military service did I ever see or even hear of someone wearing their ribbons upside down unless they were a total "boot" or it was intentional. I call B.S. that it was accidental. And if it was accident this general is just a total moron!! Last edited by ShadowMan; 02-11-2019 at 03:38 PM. I used to service government contracts and anyone who knows anything about the military knows how big they are into CYA. I spent 2 years of my life where I wore my tux 2-4 times a week. There were certain office specific pins and such that I wore. Quite clearly one can't do this with only ONE tux. So, about every other week one would go to the dri-cleaner and the other would be set up so I didn't have to think a lot after work. just climb into the monkey suit and drive QUICKLY to some place in my District for the "festivities" (Installations of Officers or Inspections, or on occasions District meetings). More than once I looked down as I got out of the car and went unprintable missing something that SHOULD have been on the tux. I can understand his chagrin. I know, right? Some people obsess over their fruit salad. Obsessively. I was designated to hold the guidon for a change-of-command ceremony, and we did a rehearsal the day before. The old CO saluted it and I passed it to him, who then turned to the new CO who saluted it and took it from the old CO who saluted it again, and the new CO passed it to me. By the time it got back to me I could barely stand from laughing so hard. They found someone else to hold it for the real ceremony. and make a determination if he should be replaced. Are you kidding? An officer who admits his mistakes? He should be promoted!